"Mom! What am I gonna do? Halloween is in a few days, and I need a really great ghost!" 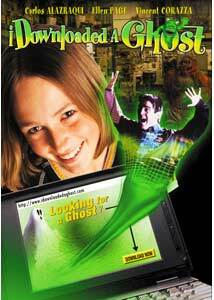 Cable channels like Disney and ABC Family are filled to the rafters with lightweight, low-budget films like I Downloaded A Ghost, which are generally follow the same kid-friendly rule, in which some likeable youngster has to best some bad guys or get the one up on a bullying classmate. In this example, it's the new kid in town, a 12-year-old named Stella Blackstone (Ellen Page) whose primary dream is simply to put on a better haunted house than bitchy, well-to-do neighbor Teri Tomlinson (Krista Mitchell). Stella's all about the scary, and she spends most her time in the family garage, which she has converted into a creature factory, tinkering with assorted skeletons and monsters. The titular ghost that is accidently downloaded by Stella is in the form of recently deceased cab driver and wannabe stand-up comic Winston (Carlos Alazraqui). It seems that Winston is destined to spend eternity in limbo unless he right some wrong, which in his case is locating the priceless Burmese Feline statue that just so happened to be in his possession when he died. What follows is typical kid-vid stuff, whereby Stella, Winston and nerdy brainiac Albert (Michael Kanav) team up to outsmart a couple of genre-required inept robbers (weasly skinny guy and bumbling fat guy—check! ), and in the process learn a thing or two about themselves. The plot inconsistencies are a constant, but you have to cut a film like some slack because it's not exactly geared toward the Criterion crowd. Why does bitchy Teri (Krista Mitchell) look like she's a well-proportioned 18 when she's supposed to be in 8th grade? Why doesn't Winston solve the crime by himself, since he can make himself invisible, rather than involve two young children? Youngsters will probably do some heavy-duty eye rolling during Winston's alleged free form comedic bits, which I think are meant to mimic Robin Williams' Aladdin work; considering the kids in the movie do the same thing it's more than understandable. Alazraqui's Brando impressions (always a kid favorite, I'm sure) are offset by the aforementioned crooks, who actually do the whole skinny-guy-hitting-the-fat-guy-with-his-own-hat bit, which was old when Skipper used to do it do Gilligan. They won't be dishing out acting awards any time soon for this, but darn if that Ellen Page is easily the most watchable part of this whole film, which otherwise is filled with very, very wafer-thin sitcom characters who move and act like they're in a cartoon. She shows of the proper of amount of frustrated pre-teen angst and exasperation to make her character the most lifelike one here (hey, I have one of those pre-teen angst machines in my house), and while that maybe isn't the hardest thing to do in something like this where she is literally surrounded by broad stroke caricatures, it is a fair enough statement to say that she indeed made this moderately tolerable enough for an adult to sit through. Yes, I know I'm not the audience for this. So, I will defer a bit to the target demographic: my own 12-year-old daughter had some apprehension about watching it (thinking it looked a little too juvenile), but she readily admitted afterwards that it was "pretty good", so take that for what it's worth. Image Transfer Review: MTI has issued I Downloaded a Ghost in a pleasant-looking 1.33:1 full-frame transfer. Clean and devoid of any glaring print defects, the film is filled with solid, well-rendered colors and strong black levels. Not a reference disc, but surprisingly nice. Audio Transfer Review: Audio is provided in 2.0 surround, and while not a particularly robust mix, the presentation suits the material just fine. Rear channels are used sparingly, but come to life on occasion, primarily with score elements during a few of the peppier scenes. Dialogue remains discernible and clean throughout, and some minor directional imaging is evident once in a while across the front channels. Extras Review: I only had an advance copy to review, and the only extra included is a trailer. My screen copy was not cut into any separate chapters, nor did the subtitle option work. However, a blurb on the packaging indicated the final street copy will have "interactive menus, scene selection, optional Spanish subtitles, trailers and a trivia game". I believe this one falls under the heading of cute and harmless family fare, and I Downloaded A Ghost should appease the 10-12 year old crowd pretty well. Oafishly silly villains, a wisecracking ghost, smart kids, and of course good triumphing evil, even if it's just that snotty rich kid from down the street.